If your child is one of the 4.8 million children in the U.S. affected by asthma, you should know about the DOSER. In most families with asthmatic children, there are many different people involved in child's medication regimen - parents, babysitters, school nurses, coaches, and the child are all involved in keeping track of the inhaler use. Being able to communicate effectively and objectively with all these care-givers can be a challenge. The DOSER eliminates the confusion and uncertainty about your child's inhaler use. With the DOSER, you have reliable and accurate record of your child's inhaler usage. The DOSER helps avoid the frustrating, and dangerous situation of being caught with an empty inhaler. 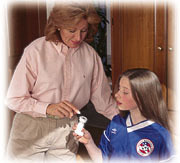 You will never have to worry about your child not having the medication he needs during an asthma event. A Michigan mother of a 12-year-old asthmatic said, "The DOSER gives you a sense of control over a situation that you feel like you have no control over. With the DOSER, I am always confident that my daughter is taking her medication. I can take one look at her inhaler at home, or the one she keeps at school, and know whether she has taken her puffs. It basically puts an end to the guesswork."